This week I had the chance to speak to Joe and Chris from the newly-established, Birmingham-based poetry collective Naked Lungs. Aiming to draw like-minded individuals together to work creatively, Naked Lungs seek to dissect Birmingham for it’s creative talent and properly showcase it. Considering the lack of literary platforms for budding poets, spoken-word artists, and writers in Birmingham, the work and events Naked Lungs has planned for the next nine months is exciting. Enough from me, I’ll let their answers do the talking. 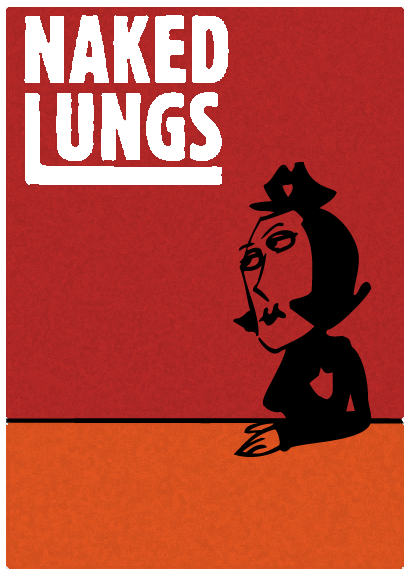 How did Naked Lungs begin? 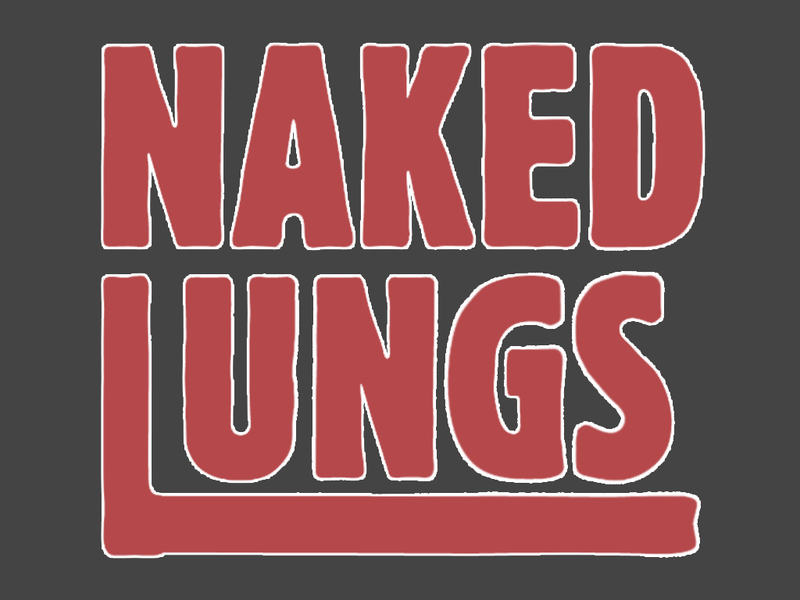 J: Naked Lungs essentially began around two years ago as a pipe dream between friends of creating a platform to express our feelings about the complexities of Birmingham on many different levels. We had a collection of ideas and concepts but in all honesty had no idea how to channel them. We attempted to set up some form of spoken word event to little avail, fast forward two years of debauchery (we really couldn’t mean this more literally) and here we are, fingers pulled out, with a first event and publication just three weeks away! What’s your ethos and aims? J: As stated above we want to provide a platform for people to perform and publish their work on their own terms. We are independent of any main institution and have nobody setting targets or goals for us, enabling us the freedom to set these for ourselves; each and every person who appears at either the event or in our publication has spent time honing their craft and we just want to give them a place to share it, shape it, discuss it and hopefully enjoy it. What have you got planned over the next six to nine months? J: Over the next three months we will have three events (25th April, 23rd May, 27th June) and each event will coincide with the releasing of a publication; each will be held at the fantastic Greenhouse cafe in the Custard Factory and will feature a range of poetry, live art, philosophical debate and much more. After that we are taking the summer off to take stock, reassess and hopefully come back with even bigger and more fantastic events come Autumn! What got you interested in the world of literature? J: Depressingly for me, as in right at the start, it was Harry Potter. I’m not afraid to say it. Well, maybe a little. In terms of literature on a more adult level it would have to be Kerouac and Ginsberg, the pure unadulterated violent ways they write in parts of Howl and On The Road really appealed to me and are probably the original reason I picked up a pen in the first place. C: I spent a year of college failing an A level in physics but reading about it was one of the things that made me think about the world in a different way. After that I realized that the world was an immense and infinitely complicated place and that I could at least begin to navigate it through books. I got into the beats because they gave me a sense of some irreverent energy and honesty and genuinely moved me – they were probably what got me seriously interested in writing. Who would you cite, as a collective, as your main literary influences and for what reasons? C: Personally, anything that makes history feel tangible, things that make you smile in the street, time, rain, soil, and incredulity. Allen Ginsberg was formative, more recently Carl Jung because his writing feels like ancient wisdom and Jay Griffiths for her awe inspiring poetic tirades and similar essence of timelessness. C: I’m going to attempt to justify this shameless plug by saying that we genuinely love meeting people and learning about how they approach the world. If you would like to contribute to our publication or speak at one of our evenings then do drop us a line at contactus@nakedlungs.co.uk. We are interested in art of all kinds it, be it written, spoken, etched, assembled, recorded, thrown, thunk, knitted (Assuming someone wants to wrestle knitting away from it’s firm foothold in dubious knitwear). Naked Lungs enthusiasm, independence, and wide-ranged of influences promises, to me, an exciting collaboration from a number of individuals who seek to honestly showcase artistic talent concerning Birmingham. 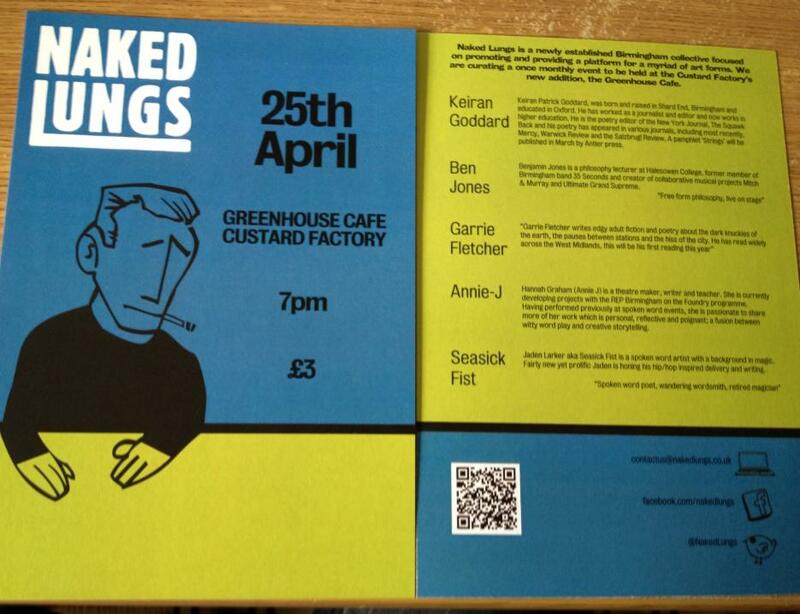 Get down to the Greenhouse Cafe in the Custard Factory on the 25th April for what promises to be a fantastic night of poetry, philosophy, and spoken-word inspired by hip-hop. Featuring Ken Goddard, Ben Jones, Garrie Fletcher, Annie J, and Seasick Fist. Click here for more details on the event.